Duke offers the most complete line of traditional, fully functional Bear Traps on the market. These traps feature cast steel jaws with serious teeth, cast pan and tempered long springs. Due to legal reasons, the Bear Traps are not recommended for use. However, if you are looking for a serious fixture to decorate your home, cabin or store, these traps will surely stir some excitement. 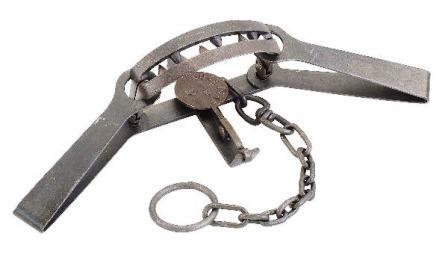 This Duke No.15 Double Long Spring Bear trap comes equipped with chain, offset jaws with teeth. Measures 36" in total length and weighs 21.5lbs. Imagine this rustic Bear Trap in your den, cabin, etc. Great for collecting or decorating. CAUTION! THIS TRAP CAN BE SET AND FIRED. Jaw Spread: 12". Customer reviews and ratings Click here to rate and review this item. This is the most awesome trap I have ever seen! There was nothing so powerful as this used in Australia, even the man traps used although mostly larger did not have as powerfull springs. Thanks Molnar Outdoor for your wonderfull service. Regards Pete.